Credit: Courtesy of D. Corry. An invisible particle enters your lungs. The next thing you know breathing becomes difficult. You are having as asthma attack. Asthma is one of the most common and difficult to endure chronic conditions. About 30 million Americans experience asthma attacks and 3 million have a severe, therapy-resistant form of the disease. In some cases, the condition can be fatal. "Despite the prevalence of asthma around the world, therapy for this condition has not significantly changed, with a few exceptions, in the last 70 to 80 years," said Dr. David Corry, professor of medicine-immunology, allergy and rheumatology at Baylor College of Medicine. "For the most part, we are still treating the symptoms of the disease, not the underlying causes. In this work we present a novel new way to target a pathway we think is at the core of this allergic condition." Current treatments attempt to relieve typical asthma symptoms, namely the constriction of the airways so patients can breathe easily. Treatments may also include steroids to shut down the inflammation that scientists have thought for many decades underlies airway constriction. Inflammation of the airway leads to shortness of breath, and that can make people panic and head to the emergency room. Corry's laboratory has been studying asthma for about 20 years. One of their interests is to better understand the molecular pathways that drive airway constriction. An asthma attack is anything but a simple event. It begins when environmental factors – allergens – enter the lungs and activate a chain reaction of molecular pathways that set off the development of the disease. Allergens activate immune cells, recruiting them to the lungs and leading some of them to produce a strong IgE antibody response and others to secrete immune mediators called cytokines. Cytokines IL-4 and IL-13 in particular are required for asthma to happen. These cytokines activate another molecule, transcription factor STAT6, that drives the expression of a number of genes ultimately leading to the exaggerated contraction of the airways that causes the much feared shortness of breath. Mice that are genetically engineered to lack STAT6, also lack the responses triggered by the IL-4/IL-13/STAT6 interaction and are completely resistant to asthma attacks. "STAT6 is at the epicenter of the immune responses that mediate asthma, so we looked for a means to block STAT6 activation," said Dr. J. Morgan Knight, post-doctoral fellow in the Corry lab. "To activate STAT6, IL-4 and IL-13 bind to their corresponding receptors on immune cells. These receptors share a critical subunit called IL4R-alpha that activates STAT6. However, additional research from our lab has shown that completely different receptors can also activate STAT6. So, we focused our efforts on developing a small-molecule that would bind to and inhibit STAT6 activity directly." Such efforts are no small feat. Corry, Knight and their colleagues had to design a small molecule capable of specifically targeting STAT6, which is inside the cells of the lungs, without also triggering unwanted side effects. "After years of work, we succeeded," said Knight. "We chemically synthesized a small molecule called PM-43I that can inhibit STAT6-dependent allergic airway disease in mice. Moreover, PM-43I reversed preexisting allergic airway disease in mice with a minimum dose of 0.25 μg/kg. Importantly, PM-43I was efficiently cleared through the kidneys and had no long-term toxicity. 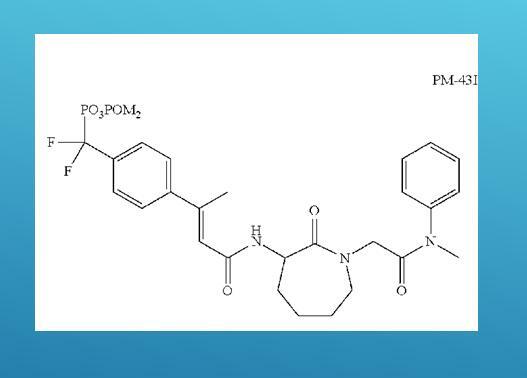 We concluded that PM-43I represents the first of a class of small molecules that may be suitable for further clinical development as a therapeutic drug against asthma." One major advantage of developing PM-43I as an asthma drug that specifically targets a path that is required for the disease is that people probably would not need steroid treatments at the same time, which is what current asthma medications sometimes are paired with. Steroids shut down inflammation, but also other immune responses, such as the body's ability to fight an infection. The researchers' work shows that in fact treatment with their small molecule can control the asthma without impairing the mice's ability to fight pathogens. "This is important because there is a higher incidence of pneumonia in people with asthma, presumably because of the steroids they take," Corry said. "Steroids drive down all the immune system, but our small molecule specifically targets the pathway that leads to asthma, uncompromising the other pathways that allow the body to fight disease. We anticipate that patients treated with our small molecule would not need steroids as our treatment alone would be able to control the asthma. Consequently, these patients' ability to fight infections would not be affected." Although other groups have developed monoclonal antibodies that effectively target IL4R-alpha and inhibit STAT6-dependent allergic disease, and these antibodies are close to be approved by the Food and Drug Administration, the researchers think that their small-molecule approach offers unique advantages when compared with the much larger antibodies. "We think that our small molecule offers the option of being easier to make and less expensive than the monoclonal antibody approach," Corry said. "Also, people might develop sensitivity or tolerance to the monoclonal antibody treatment. On the other hand, our compound is a chemically synthesized very small molecule, so we think there is a smaller chance that people would develop a sensitivity to it. In addition, we think that our small molecule is better able to block STAT6 than the antibodies." "I am most excited about the potential to really affect disease," Knight said. "I think that if our small molecule approach can help the lung resolve the chronic inflammation that is driving the asthma attacks, it might be possible to also resolve their condition." "The ideal way to manage any disorder is to get at the root, the fundamental underlying cause. In asthma, we can break it down into endogenous factors, in this case inflammatory, where STAT6 comes in, and then the environmental, and that is the nearly invisible particles," Corry said. "Ideally, we would target both of these at the same time. This is our first shot at applying a modern understanding of disease to therapy. That's what I am most excited about, developing a modern approach to treat this common disorder," Corry said. The researchers are working toward moving this small molecule to the next stage of testing in clinical trials in order to one day make it available to people. Read all the details of this work in the Journal of Biological Chemistry. Other contributors to this work include Pijus Mandal, Pietro Morlacchi, Garbo Mak, Evan Li, Matthew Madison, Cameron Landers, Brandon Saxton, Ed Felix, Brian Gilbert, Joel Sederstrom, Atul Varadhachary, Melissa M. Singh, Dev Chatterjee and John S. McMurray. The authors are affiliated with one or more of the following institutions: Baylor College of Medicine, MD Anderson Cancer Center, Michael E. DeBakey VA Center for Translational Research in Inflammatory Diseases and Fannin Innovation Studio and Atrapos Therapeutics, LLC. Financial support for this project was provided by United States National Institutes of Health grants R41AI25007, R01 HL117181, Veterans Affairs Office of Research and Development grants I01BX002221 and I01 CX001673, the American Asthma Foundation and the Biology of Inflammation Center at Baylor College of Medicine. J.M.Knight, P. Mandal, P. Morlacchi, D.B.Corry and Atrapos Therapeutics, LLC hold intellectual property rights in compound PM-43I.